Last update: March 18th, 2019 – See the online changelog, we listen and we act. 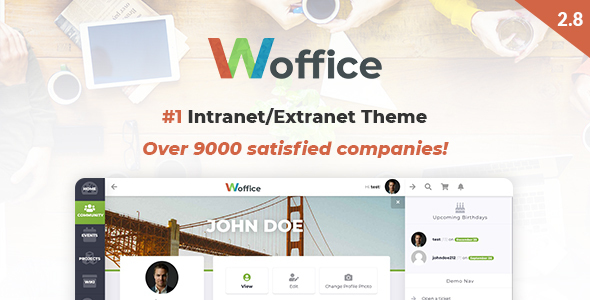 Woffice is a feature rich, powerful Multipurpose Intranet WordPress theme. All is wrapped with an easy-to-customize design inspired by Google’s Material Design, giving it a beautifully modern feel and easy to navigate User Interface. 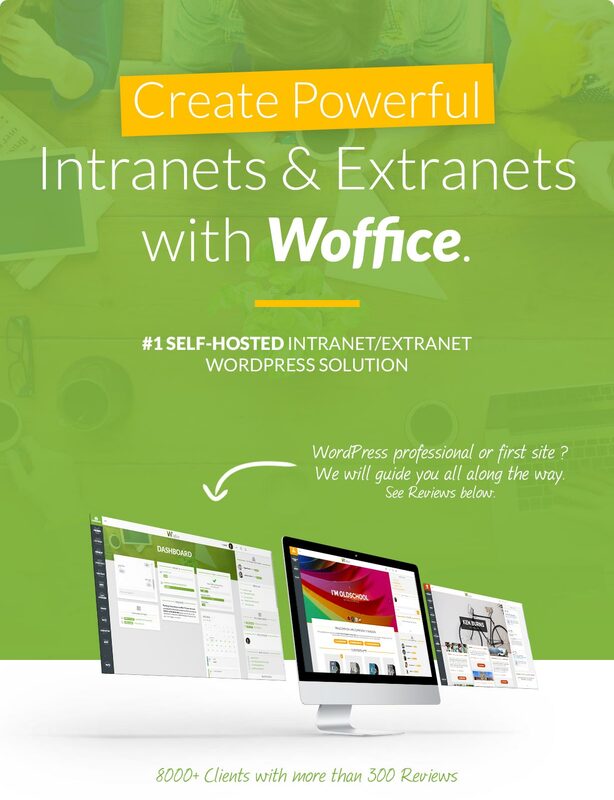 Woffice is fully adaptable to a wide range of applications including Business & Government Intranets / Extranets, School Networks or any Community Network and Associations/Charities. 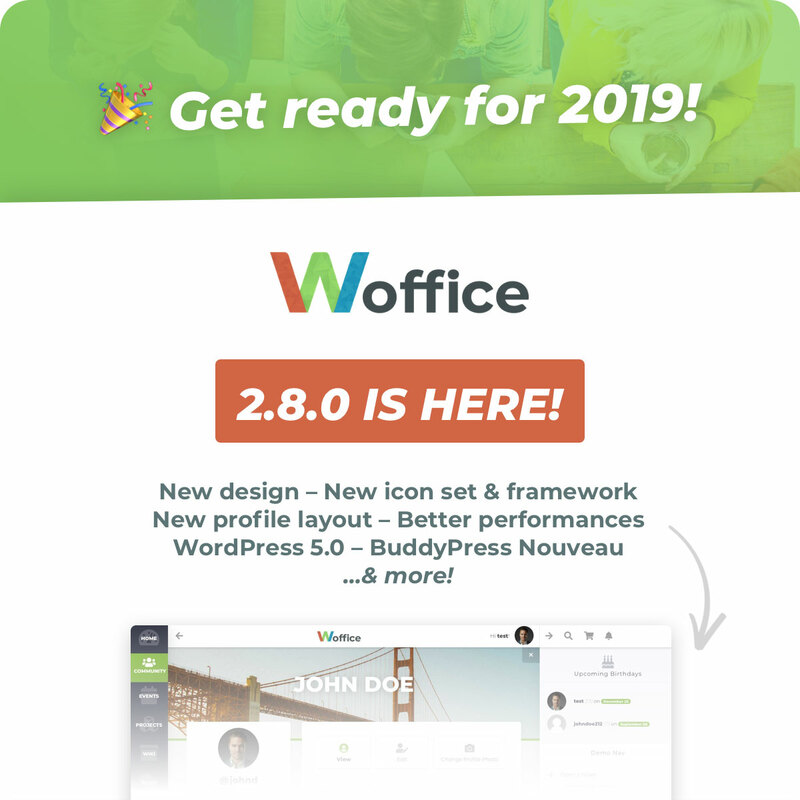 If you need a sure way to get started quickly and easily on your next awesome project, Woffice is what you need. Using the best CMS and its advantages to make you build something different.Easily. Built with the highest standards of Coding, and fully Responsive, it comes with: a complete Buddypress Network, Custom login page, Projects management, Wiki, Chat and messaging, Files Manager, Calendar, Directory Extension, Forum, E-commerce and so much more! Build your own Social or Community Network, Intranet/Extranet, Project site with Member Logins, School Intranet, Forum or even a Wiki! It’s all included in the one off fixed price! Everything you need to build anything you can dream up right out of the box. Whether you want to create an Intranet, Extranet, Community or any web app. We believe, it should be accessible to anyone with experience or not on WordPress. Giving the right details to the right customer in order to provide an unique experience for your members with truly awesome features. That’s our job on Woffice. Members Directory (+ profile image, role, filter, unlimited custom fields with icons, you can hide some members types). Well there is a lot of other features but that’s a good start. You can also take a look on the changelog below you’ll see detailed features added in the last weeks. Works with thousands WordPress plugins, endless possibilities! Forum : BBpress! bbPress is forum software with a twist from the creators of WordPress. Easily setup discussion forums inside your WordPress.org powered site. Live Chat : Wisechat! Advanced chat plugin for WordPress. It requires no server, supports multiple channels, bad words filtering, appearance settings, bans and more. Facebook login : Nextend! One click registration & login plugin for Facebook? Easy installation? Is it totally free and comes with support? Yeah! Charts and Graphs : Visualizer! A simple, easy to use and quite powerful tool to create, manage and embed interactive charts into your WordPress posts and pages. Approve new users : New User Approve! New User Approve allows a site administrator to approve a user before they are able to login to the site. Premium Membership : PaidMembershipPro! Unlimited levels, recurring payments, protected member content and robust member management. Albums & Video : Rtmedia! Add albums, photo, audio/video encoding, privacy, sharing, front-end uploads & more. All this works on mobile/tablets devices. Badges : BadgeOS & Credly! BadgeOS? is a powerful free plugin to WordPress that lets you easily create achievements and issue sharable badges as your users succeed. Files management : File Away! Upload, manage, and display files from your server directories or page attachments in stylized lists or sortable data tables. Cache : WP Super Cache! A very fast caching engine for WordPress that produces static html files. The theme (.po file) is currently translated in English, French, Spanish, German, Persian, Russian, Japanese, Portuguese, Italian, Bulgarian…Complete RTL support as well. And best of all our turnaround time is between 4 – 8hrs! We are committed to providing weekly updates & bug fixes – you can find a full Changelog below. - (FIXED) Weird character appearing in the BuddyPress members directory. - (NEW) Option "Members per page"
- (FIXED) Prevent the loop if Maintenance page is missing. - (FIXED) Prevent the project page content to be rendered if no content is set. - (NEW) Alka Pro is in the air! Beta is over, thanks to our testers. New features, new services, for free. - (IMPROVED) Changed the behavior of checkbox "complete projects", now they are "archive projects"
- Woffice 2.4.0 comes with a brand new Time Tracking extension to let your staff clock in and out. Also many improvements for the projects, a complete re-design of to-do manager for better performances as well as a new Masonry layout for the listing. - (IMPORTANT) Changed the behavior of the option "Projects are public?" in Theme Settings > Permissions > Projects. See the new option description. - (IMPROVED) Order of the posts displayed using the Visual Page element "Blog Posts"
- (NEW) Integrated plugin "Social Articles"
- (IMPROVED) Splitted the permission option in "Who can create post" and "Who can edit post"